You know how google releases new products on April 1st along with a few elaborate pranks? The pranks make people question the real products and the real products set up an air of suggestion that help their pranks be better received? Yeah, that's cool. 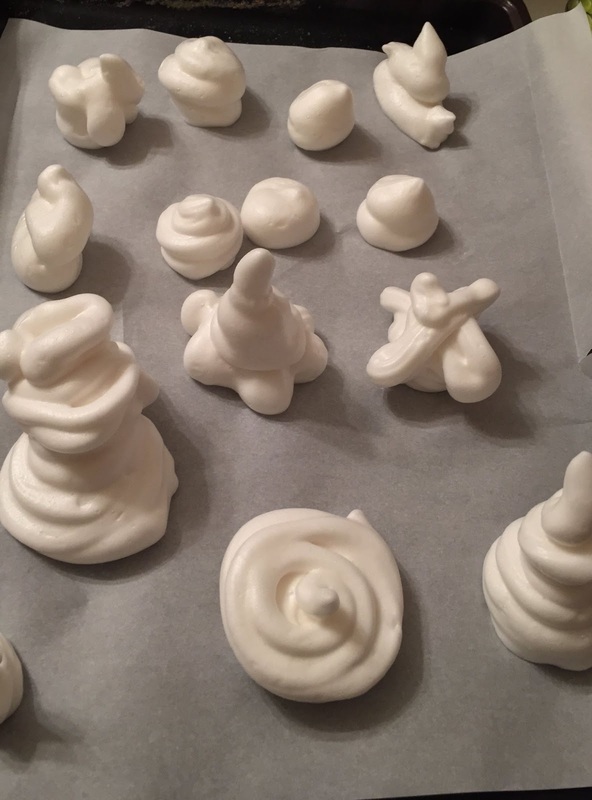 For a bit of fun, I posted two April Fools day recipes to the Vegan Meringues - Hits and Misses! group. The first was from Seugnire M Nagev (vegaN M eringueS, backwards, of course), and was a recipe for a unique one ingredient meringue, using technique alone. Given my initial post of the two ingredient meringue, that was the next logical step. The other was for detailed instructions on how to make a vegan Angel Food cake with a secret message. Here is a new hits meringue made with just the sugar. Der is no chickpeas here. So now here is my discoveryd recipe.. 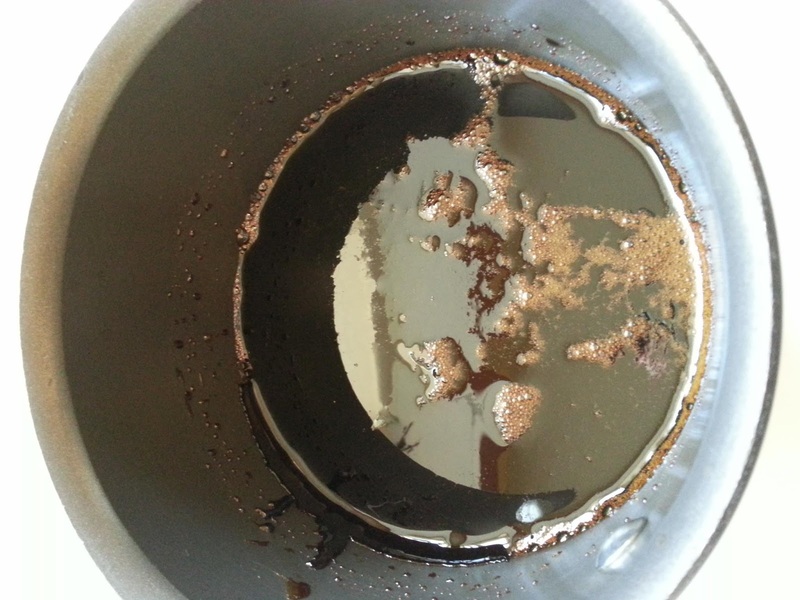 Put sugar on d stove and cook it for thirtee minutes. Put in hot your mixer after the time is up. Mix it slowly until it gets cold and turn up mixer to fast speeds. Now the hard part. Mix the sugar for 8 hours to make it very fluffy. Then put on tray in pretty spirals, and cook its at 80C for 8 hours!! It is a tasty vegan meringue! This is how we say, "gutpela tru!" I love that picture. It has just the right balance of color, curvature, and reflection that makes me want to stare into it all day long ... almost like molten metal. If you want to see the mess it turned into, visit the meringue hits and misses page. The second post was a bit more involved, but here it is, complete with a super secret! Powdered aqua faba is made from legumes. Legume is just a fancy word for plants in the scientific family called fabaceae. Edible grain legumes are called ‘pulses’. Among the pulses are dry beans like pinto beans, kidney beans and chick peas. Some of these pulses seem to be better than others when it comes to making meringues, but in general they all work because they all contain some critical ingredients, one of which is surprisingly important. Every pulse bean contains a substance called hemicellulose, which is a part of a group of sugars called heteropolymers, and includes, but is not limited to, xylan, glucuronoxylan, and an exceedingly interesting one, called glucomannan. Do a search for glucomannan online, and you’ll inevitably find your way to the description of a plant called konjac, or konjac mannan. On wikipedia it states that the composition of the corm of the konjac plant as 40% glucomannan gum, which is a very, very viscous thickener, similar, in fact, to heavily reduced aqua faba. Now, many vegetable gums and gelling agents are available, and have been tried in meringues and in baked goods with varying success by members of this group and in also in the food industry. Only, konjac mannan behaves a bit differently than these other commonly available vegetable gums. The gelling agents like agar activate in a liquid state when you heat them and solidify when you cool them back down. Glucomannan, however, has a novel property. It can be made to solidify *when heated*, all the way up to 400 fahrenheit (200 centigrade) and remain that way when cooled, just by adjusting the ph of the solution in which it is dissolved. Vinegar is a common addition to many meringue recipes we have seen in this group, and results in a slightly acidic foam. Egg-white derived foams are particularly sensitive to ph and prefer a slightly acidic environment, but we’re talking about the amazing aquafaba(tm) here, not some animal-derived egg white. Tinkering with various recipes, cake mixes, gums, and legume-derived foams day in and day out helped us discover just exactly what the beanjuice needs in order to emulate the protein network in an animal-derived egg foam. Heat is usually an aquafaba foam’s worst enemy, which is why a direct substitution of foam for foam in an angel food cake ends up resulting in a horrible puddle in the oven. Eggs, however, survive being heated by transforming into the very protein network that angel food cakes need to provide that light, fluffy goodness. So consider this …. just imagine being able to go into a store, buy a box of dry ingredients, add water (not even eggs, just water! ), do a little whip-whip-whipping, and voila! Egg-free angel food cake, made from nothing but plant-derived dry powders! Cake for everyone! Recreating angel food cake has probably been on the mind of everyone who has ventured into the vegan meringue party that is this group. Even our non-vegan friends are asking how the angel food cake development is going. That all changes now. After today, you are never going to look at angel food cakes quite the same way. Pseudo-plastic liquid (the name for water solutions of konjac glucomannan) will become a household word, and people will be singing from the roof-tops. Right, so enough of all that … what’s the secret? Innovative food developments like this are complete game-changers. Look at what’s happening in the food industry. Food industrialists are hungry for innovative products. Organic products are on the rise. Other products that are vegan, and based on simple, plant-derived ingredients are key to reducing the needless suffering of beings with whom we share this plant. Let us transform the world, one meringue, one cake at a time. Simply read each capitalized letter of this post to learn the secret, and help save the world! woah ! SUGAR ALERT! SUGAR ALERT! Sorry, but not in favor of April fools they are useless and can really harm someones emotionally or physically and we should try to avoid these types of days.